Welcome back to this weeks CASEing the Catty blog hop! We are up to challenge CTC 159 and can CASE anything from the Holiday Catalogue this week! Such choice! I am a bit excited to share this weeks project with you all for 2 reasons. Tonight I am CASEing the card at the very top of the boxes! So here is my Brightly Lit Christmas Card for you all! I really wanted to show off some of our Merry Music DSP without obscuring the lamp post, so I created panels for this card to do just that. and of course being Christmas, it needed at least a bit of sparkle – so our Foil Snowflakes sorted that for me too! These colours are not colours I would traditionally use or choose for a Christmas card, but I think they work quite well together and I love how the Merry Music DSP has Christmas Sheet Music so had to show that off too! But I have to say – the one item that REALLY rescued me when creating such a stack of these cards was our Multipurpose Adhesive Sheets! These sheets were new in this years Annual Catalogue. I simply attached a piece to the back of a piece of black cardstock before running the dies through the bigshot. 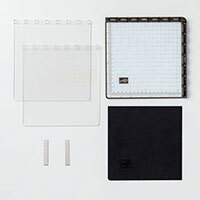 It was then simply a matter of peeling away the backing paper and adhering the lamp pieces directly to the cardstock! Oh. My. Goodness. What a time saver! Seriously – if you haven’t tried it yet – you really need to! Especially for the more intricate pieces that you need to adhere! No messy tombow fingers at all! Cut your Foil Snowflakes in half and adhere to Merry Music DSP before adding the Basic Black layer, which will overlap slightly. I hope you are all ready for Christmas now! Now it’s time to hop on over to the lovely Julia and see what she has created for you all! Why not get a head start on next Christmas by picking up a bargain at our Year End Sale! Well hello everyone! Have we got a fun CASEing the Catty for you tonight! Tonight we get to CASE a project form the page that’s your age! Lol. And it can be from any catalogue! We also had a disclaimer clause that we could use the page that is the age we would like to be!!! How much fun is this weeks challenge going to be! I can’t wait to see all your projects as you play along for this one! I CASED the layout from the little notebook on the left hand side. Initially I was going to use the same coloured DSP from the Colour Theory Suite, but then I completely changed my mind, pulling out the yet to be used Petal Garden DSP Stack instead! As you can see, I changed up the colours and imagery, but kept the basic layout the same. I don’t think I use our Fabulous Foil Designer Acetate anywhere near enough!!!! Here’s a bit more of a close up for you so you can really see the elements! The Petal Garden DSP has some really beautiful floral imagery, and those roses were fussy cut straight from a piece of it! How easy is that! I really do enjoy the variations you can create simply by CASEing a project from the catalogue and changing a few elements! I can’t wait to see what you do with this challenge this week! Well nutty season has hit! Hands up if you ave finished creating your stash of Christmas cards yet – Yeah me neither! Lol. I am bound to get there eventually. I just need everything to STOP first, so I can sit and create and write and address and post them! So because it’s not like I’m in a hurry to do that or anything … I decided to create something for CTC 157 instead – where this weeks challenge is to CASE (Copy and Share Everything or Selectively Edit) any Colour Combination in any Catalogue. Despite needing to complete lots more Christmas cards, I decided not to do Christmas at all. I have had a beautiful friends birthday this past week – so I created for her instead! I wanted the card to be a bit more special than usual, so I called upon Bronwyn Eastley’s Tutorials to help me along. Ever since I saw Bronwyn’s Coffee Cafe Easel Card I knew that I had wanted to try it with a vase, which would also be perfect for my friend’s birthday too and to top it off – the catalogue had the perfect colour combination for me to CASE. Don’t you love days you feel like you’re winning! Here is the Colour Combination I decided to CASE. You can find it on Page 28 of the current Annual Catalogue. I love the simple colours, and it even helped me design my card! So here is my version of Bronwyn’s Coffee Cafe Easel Card using the Jar of Love Framelits! My Jar of Love Easel Card! Now I can’t share how to actually create the easel – you’ll need Bronwyn’s tutorial for that! But I can tell you that to get the variance in colours for your flowers, use the stamping off method. That means you can get more use out of your available colours. Each colour used here is only one ink pad. To use the stamp off technique simply ink up your image in your chosen colour, stamp it once on to a scrap piece of paper (our Grid Paper is perfect for this), then, without inking your image stamp it again onto your card stock. This will give you a ‘lighter’ version of the same colour. The next image you stamp as normal, giving you the full colour strength. It really does help you get more use out of your colours! When creating my card, I really wanted it to give the impression of a vase of flowers on a little doily, like you would find on a table. I’m pretty happy with how it turned out. I think it could even be used as a decorative piece at home. I hope you enjoyed my project tonight! If you would like to take a look at how to make this card then you can hop on over to ADDinktive Designs HERE to purchase the tutorial! Now it’s time to hop on over to the lovely Fi and see what she has created for you all! Don’t forget you to can play along with our challenges every week. Create your own project and post a pic on our Facebook Group right HERE. Have you taken advantage of the Year End Sales and Retirement List yet? Once they are gone, they are gone for good – so why wait? Get your stocking fillers today by clicking on the image below. A big hello to you all my crafty friends! I don’t know about you, but I am pretty excited about the new upcoming Occasions Catalogue and all the wonderful new products! Did you know that a perk of being a demonstrator means we get to see all the new goodies first! and if you attend the Demonstrator Only On Stage event – you even get to play with some and take some home! WINNING! Well I thought today that I would share just a little sneak peak of one of my absolutely new favourites that will be available at the beginning of January – The Magical Day Stamp Set. I don’t normally share too much too early and ruin the excitement for you all … you know – it can be a bit of a wait and there are still so many lovely goodies in the Holiday catalogue to play with! But I couldn’t resist sharing this one! I used one of Bronwyn Eastley’s tutorials to create this card – The Lots of Labels Bridge Fold Box Card. You can purchase any of Bronwyn’s Tutorials at her ADDinktive Design Shop right HERE. She has LOADS to choose from! The Magical characters in this set are so much fun! I can’t wait to get my hands on the entire suite! I used Bronwyn’s tutorial as a basis for the card and then added a draw bridge and used the ‘grass’ to create the ‘bridge piece’ for my card. I simply trimmed away the grass lengths under where the draw bridge sits. It’s so easy to create brilliant looking characters too with our new Stampin Blends. I love that we can highlight and shade when colouring. I think it brings much more depth to the stamped images. And – our Fine Tip Glue Pen can still be used to ‘colour’ over the images. You can’t see it on the photos, but the Dragon’s belly, wing and fire are coloured with the Fine Tip Glue as is the shield and sword of the Knight to add a lovely glossy finish to the images. I also embossed a piece of Smokey Slate Cardstock with our Brick Wall Embossing Folder, trimmed away portions to adhere to the card, and sponged them with some Smokey Slate Ink. The card can even still be folded flat by lifting up the drawbridge and the folding as per instructions! I love creating something just a little bit different and I was super happy with how this card turned out. I hope you like it to! We have some amazing news for November that I just had to share with you all! We were lucky enough to see this demonstrated at our recent On Stage event! 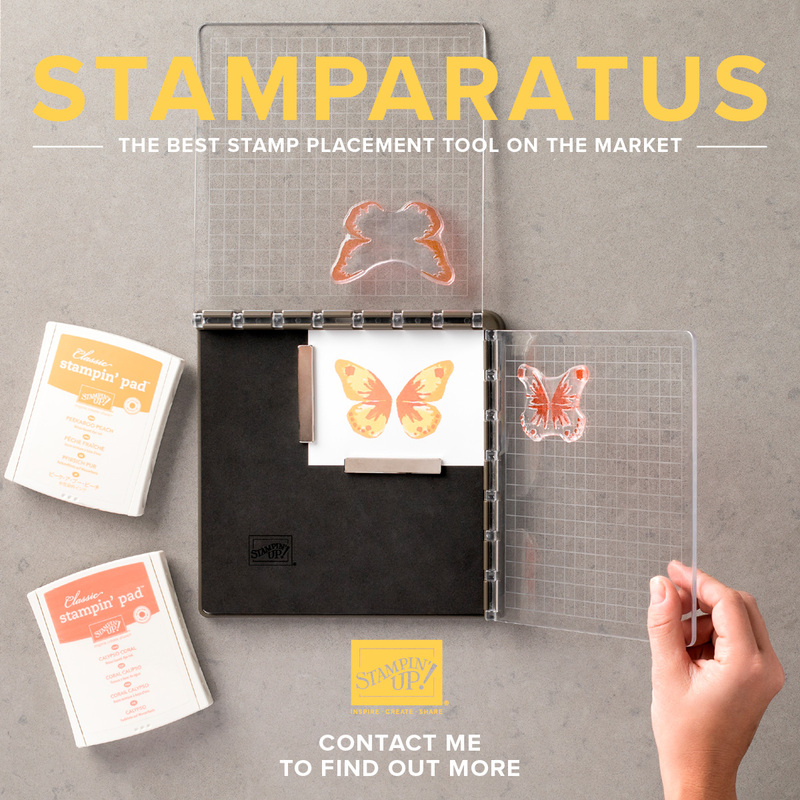 We know the Stamparatus is going to be super popular, so to avoid any backorder issues – we are trying something new! 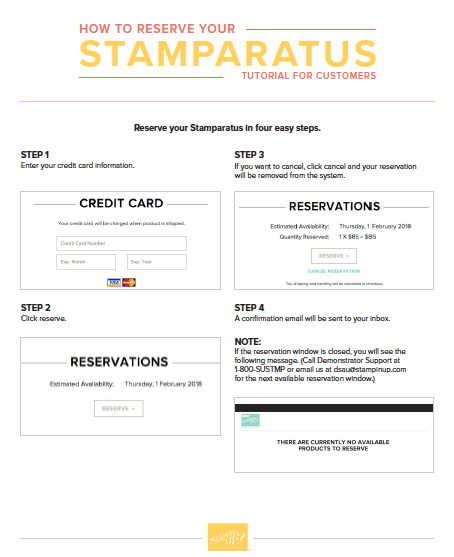 Reserve your Stamparatus to guarantee shipment when the product arrives in the warehouse. You will need your credit card to reserve your Stamparatus, but you won’t be charged until you confirm your order prior to shipment. Plus, be part of the November and December Reservation periods, and when shipment time comes around, simply add $5 more product to your order to qualify for a FREE Saleabration item! *Limit of One per customer per reservation window and then this amazing item will be available in the next Annual Catalogue! During this promotion we will have exclusive deals and sales for limited times. Our first incredible offering will be on the 20TH NOVEMBER with a 24 hour Stamp Sale where select stamps will be available at 20% off for the first 24 HOURS ONLY! Followed by exclusive deals between the 20 – 26TH of November. We will finish with a bang on the 27TH, but it’s so good I don’t even have the info yet! Lol. So make sure you are following my Facebook Page for regular updates – or log in to the Stampin’ Up! Website on the day! Remember, these deals SELL OUT FAST, so your best option is to order online. Use this months Hostess Code VKJQU6E7 for a special thank you from me! Make sure you click HERE to download the file of all the sale items! Happy to help you get your Crafting On Everyone!! !